Welcome to everyone dropping in from the Bloggers’ Quilt Festival. Our blog is dedicated to documenting all of the things we do here on Terrabyte Farm. We are a small, family-run homestead in Southern New England. Please feel free to check out some of our older posts, we do a little bit of everything from sewing, to processing and using the wool from our sheep, to preserving food from our garden, and everything in between. I made this quilt from the line Hideaway for Moda by Lauren and Jessi Jung. When I first saw these prints, I new they would make a perfect quilt for Baby M. The colors are so bright and true, just like he is! Also, there is something so simple and perfect about a patchwork-square quilt. Every child really needs at least one. You can read more about this quilt in the original post I wrote back in January. 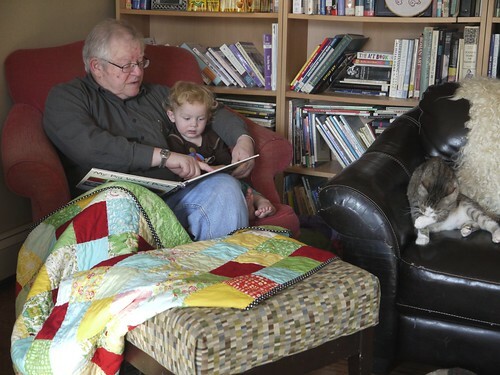 Since then, it has really become our go-to quilt for snuggling under on the couch at the end of a long day. It is a great lap quilt, measuring about 48″ by 60″. I hope you enjoy the many quilts, I know I can’t wait to see what everyone else is making! Thanks for stopping by! Wonderful bright colours for a child, Simple and Clear! Love it! I am such a sucker for patchwork – I LOVE it! The colors are super cheerful and go really nicely together. Very lovely quilt! 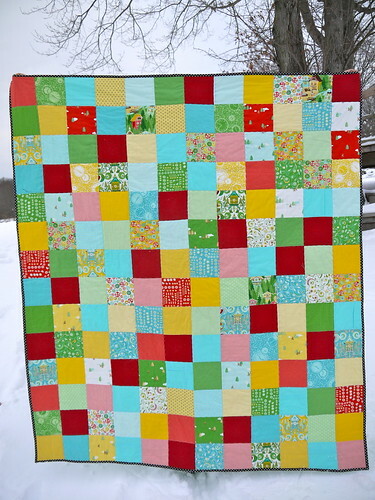 I love the cheery colors of this quilt! Agreed, sometimes all it takes is simple squares! Love it – so bight and colourful ! Couldn’t have said it better myself, simple and perfect! I love this quilt. But what I love even more is how you gave us a picture of it in use. Amazing how different it makes the quilt look. You can better see how big the squares are.